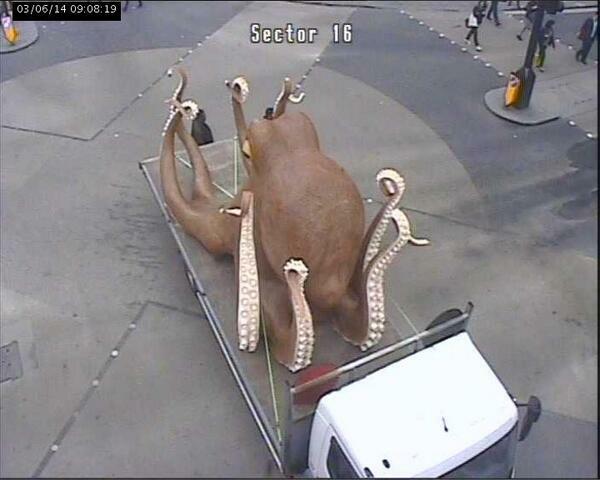 There is currently a giant octopus on the back of a ‘broken down’ hire van in the middle of Oxford Street, London. I called the number on the side of the van – as I’ve been told 4 national newspapers also did – and the guy at Roman Self Drive confirmed that the octopus is indeed a part of a World Cup campaign. No doubt related to Paul the Octopus, who gained fame during the 2010 World Cup for his ability to ‘predict’ the outcome of the football matches. I asked who was behind the stunt – which has started spreading around Twitter like wildfire – and the guy said he’d call me back as he wasn’t sure he was allowed to say. He then spoke to the delivery driver, whose number I was given. 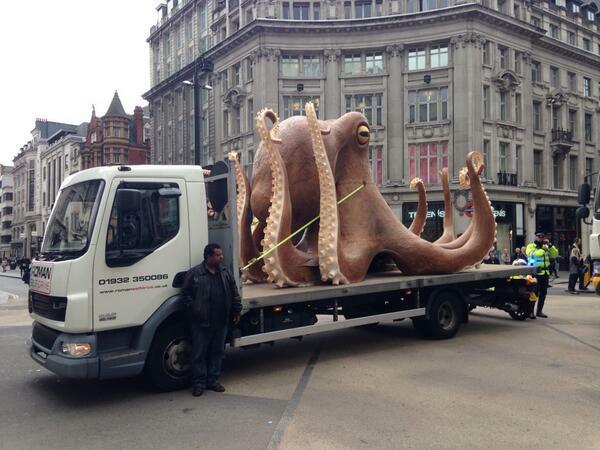 I spoke to him and he mentioned he was delivering the octopus to bookmaker Betfair, who are behind the stunt. I also questioned as to whether or not the breaking down was part of the campaign – hey, you never know – and he said ‘definitely not, and I’d like to apologise to all who’ve been affected by it’. What a nice bloke. It appears I was the first to find out who was behind it using my sneaky sleuthing ability. I’m getting traffic from Reddit, Buzzfeed and the Independent at the minute, which, you know, is lovely. If you enjoyed this post, why not sign up to our newsletter to get the best PR stunts and campaigns to your inbox every week? Go on, live a bit.